Heads up before we get into this business: the “cake” in this Strawberry Cheese Cake is playing a two-faced role here. What you see is not all you get. You see, the lovely dessert made with a graham cracker crust and a cream cheese filling, known as cheesecake, is really a cheese pie. But cheese pie sounds ridiculous, which explains why no one calls it that. This all makes sense, but when cake and cheesecake finally got together and made a new baked baby… it was difficult to come up with its name. 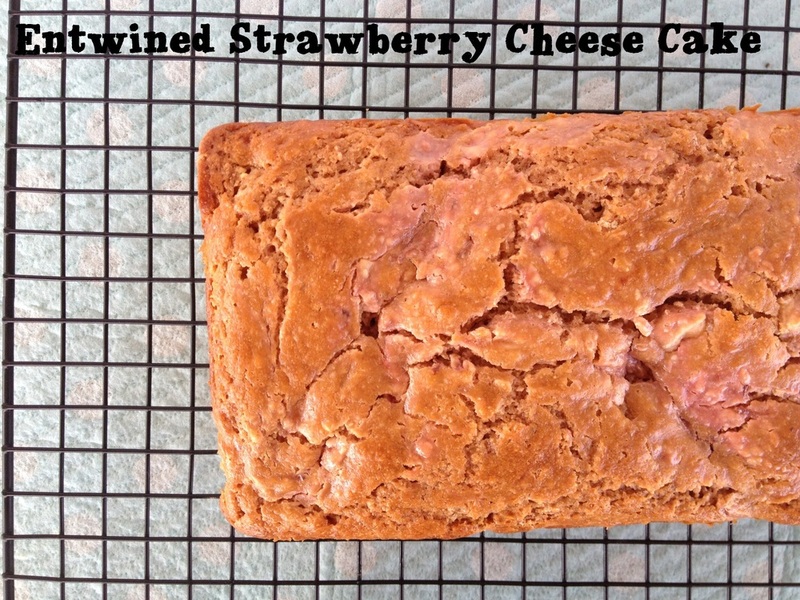 “Strawberry Cheesecake Cake” would just get the little guy beat up on the playground. The decision was ultimately made that there be only one “cake” in the name, and it gets to stand alone from the “cheese,” which makes the cake two times as special. Combine, in a small bowl, all ingredients for cheesecake filling with a whisk + set aside. Spray a 9 x 5” loaf pan with butter flavored cooking spray + set aside. Combine flour, baking soda and salt with a whisk, in one bowl. In a separate large bowl, combine all the wet ingredients thoroughly with a whisk, or with a whisk attachment in an electric mixer. Add dry ingredients all at once to wet ingredients, and combine with a rubber spatula until no lumps remain. Pour the cake batter into the prepared loaf pan. Drop the cheesecake mixture, in spoonfuls, in various places on top of the cake batter. Use a spoon to very gently swirl the cheesecake into the cake. There should be ribbons of cheesecake throughout the whole cake. Place the doubly cakey-cake into the oven for 50 minutes, checking for doneness with a toothpick. If the toothpick is not clean and it seems like the cake is still sticky inside, you can bake it for up to 10 more minutes. Cool in the pan for 20 minutes, then remove gently to a wire rack to cool completely. And that is how the cheese-cake baby is born. Enjoy with coffee and a big smile!